Totally want some of that baguette! These are great images, and I so enjoyed your IG feed during travels. I hope to see it for myself some day. I have wanderlust now!! Love the blue door!! OH, this is so glorious. I love these pictures - I mean, I really love these pictures. I love, love, love travel, and I've always dreamed of going to Paris. Hopefully I'll find myself there someday. Thank you for sharing these wonderful photos - I really enjoyed them! Blessings to you. Have a great week! Ah, I couldn't agree more with the quotation! Lovely shots and such a true quote! wonderful series! I love that blue door! Please consider yourself officially invited to participate this year's 5th Annual Gratitude (word) Quilt. Instructions (it is very simple) and a link that explains the origin of the word quilt can be found at the top of my blog. In past years there have been participants from every continent except Antarctica. If I’ve already invited you, I apologize... I am trying to reach as many people as possible, and sometimes forget whom I’ve already left this message for in a comment. My intention is most certainly NOT to spam you. I hope you'll join us, it is really amazing when all the words unfurl on November 27th, Thanksgiving Day in the United States. Great panning in front of the blue door! Paris? Anytime! I love the motion blur in the last photo. Lovely views of Paris. 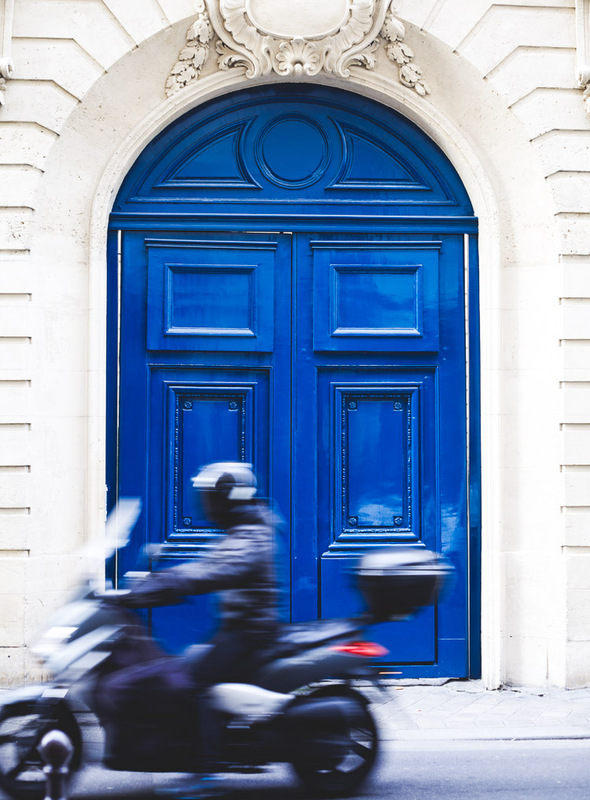 Love that blue door and it is even more intriguing to see the movement of the motorcycle. 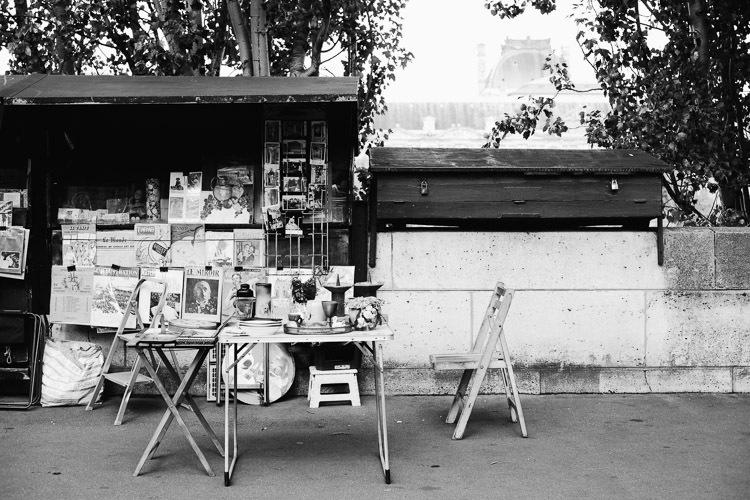 The first one, in B&W -- ah, that captures the romance of Paris. All of these are lovely! Beautiful, beautiful! It is so true, Catherine. There is no cure for Paris... Sigh... I can't wait to hear more about your trip. I had so much fun living your journey through Instagram. Thank you dear Charmaine :) I love your baguette shot and relived my trip through your wonderful Paris photos... how did I miss them before?? LOVE your photos. I clicked on the link because it said Paris and you did not disappoint. someday maybe I will get over there. someday. I've never been to Paris but the ambiance of your photos takes me there. 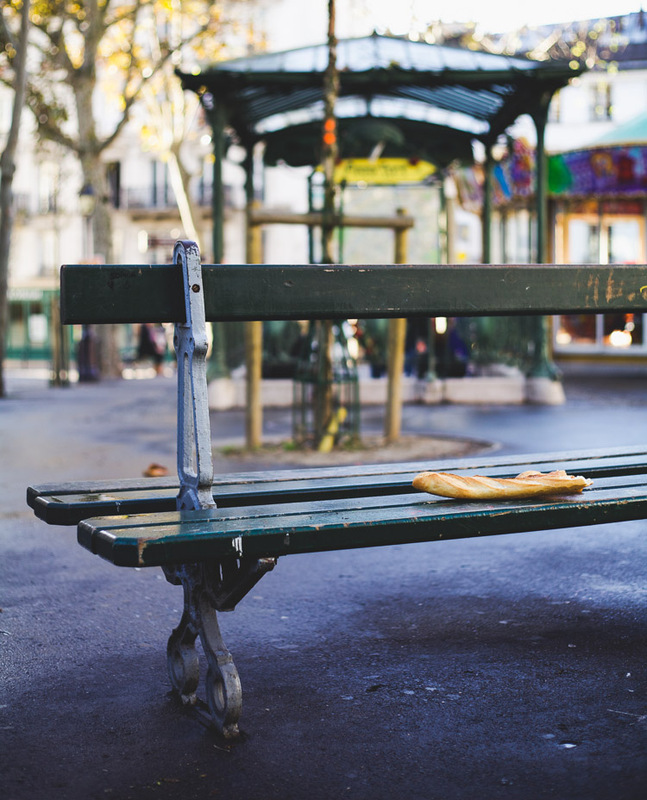 I love shot of the baguette on the bench. Your focus in all the photos is perfect!